Pheromosa in game: 1,202 Who? Important notice! Pokemon Pheromosa is a fictional character of humans. Pheromosa (Japanese: ???—?? Feroche) is a dual-type Bug/Fighting Pokémon introduced in Generation VII. It is one of the Ultra Beasts and is known by the code name UB-02 Beauty (Japanese: UB02 Beauty). 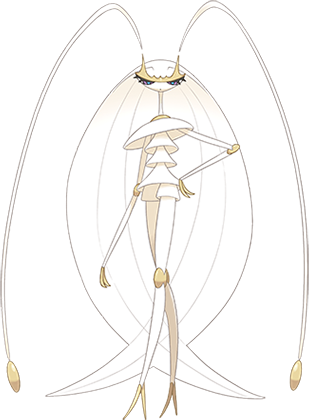 Pheromosa is an Ultra Beast mostly resembling an anthropomorphic, feminine cockroach. It has a thin build and is mostly white. It has a segmented body, having five segments dividing its torso. 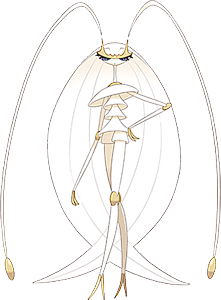 Pheromosa has a long and narrow neck, and a small semicircular face. It has narrow white eyes with a purple iris, and blue pupils. 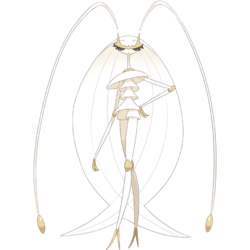 Pheromosa has long, thin legs suited for running and kicking, with golden pads at the joints. Its feet consist of two twig-like structures, rather resembling high-heeled shoes. Pheromosa's lithe, elegant body is capable of sudden feats of acceleration, able to twitch its limbs at an estimated 120 mph (200 km/h) instantaneously, a speed previously unseen in the world. It also produces a sort of disarming pheromone which was described as "previously unknown to science" that causes those nearby to become awestruck by its presence. It displays a considerable reluctance towards touching anything, as if it interprets the Pokémon world as being unclean somehow. Feroche may be a combination of pheromone, feroce (Italian for fierce), and cockroach.